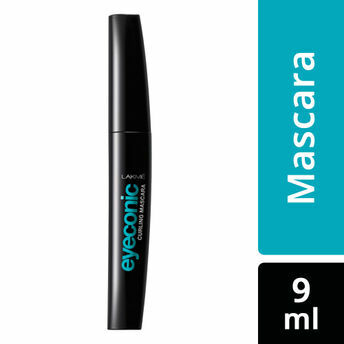 Coming from the Eyeconic range is yet another product '" The Lakme Eyeconic Curling Mascara. The Lakme Eyeconic Curling Mascara is a unique mascara that's lets you play with dramatic eye looks, by giving you intensely curled lashes. But if that's not enough, it now comes in the vibrant Royal Blue Shade that lights up your eyes like never before. The smart curl brush allows smooth strokes for perfectly curled lashes. The lightweight mascara with D-Panthenol keeps lashes smooth. The Lakme Eyeconic Curling Mascara is available in two intense shades '" Black and Royal Blue to add instant drama. You can use The Lakme Eyeconic Curling Mascara every day for enhanced lashes that complement any eye make-up look. The Lakme Eyeconic Curling Mascara goes very well with the Lakme Eyeconic Kajal which can be applied on both upper and lower eye lids. You can complete the look along with the Smokey Glam Pallet from the Lakme 9to5 Eye Quarter range. Explore the entire range of Mascara available on Nykaa. Shop more Lakme products here.You can browse through the complete world of Lakme Mascara .Alternatively, you can also find many more products from the Lakme Eyeconic Curling Mascara range.